Deputy Minister for Railways Development, Hon. 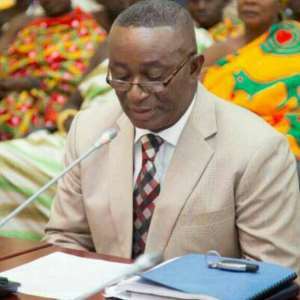 Andy Appiah Kubi has asserted that the current economic management team headed by Vice President Dr Mahamudu Bawumia is the best ever economic management team in the history of Ghana. The Asante Akim North MP made this revelation in an interview with Modernghana.com in Accra on the sidelines of the town hall meeting organized by the EMT. The astute lawyer and first National Youth Organizer of the ruling NPP government said, "I can state without any equivocation that the current Economic Management Team, under the stellar leadership of the energetic, strong and brilliant economist, H.E Dr. Mahamudu Bawumia, has been the best in mother Ghana's history. They have risen to the occasion and put the economy of Ghana on the right footing despite inheriting a very weak and porous one from the previous government". The MP further stated that the various interventions spearheaded by the EMT such as reducing taxes, bringing down inflation and interest rates, the significant falling of fiscal deficit (on cash basis) from 6.8% of rebased GDP in 2016 to an estimated 3.8% in 2018 among other positives were attestations to the solid credentials of the team tasked to spearhead the economy of Ghana. He further stated that, "Through the unrelenting efforts of the EMT, our macroeconomic fundamentals are solid, and all the critical indices are pointing in the right direction". Vice-President Mahamudu Bawumia, together with other members of the Economic Management Team (EMT) addressed the public on the economic gains Ghana has made since the New Patriotic Party assumed office in 2017. The economic guru in his presentation urged the opposition National Democratic Party (NDC) not to jump into conclusions that the free fall of the Ghana Cedi is as a result of weak fundamentals under the Akufo-Addo government. He insisted that the NDC's best performance under the John Mahama administration is the New Patriotic Party (NPP) government's worst performance ever. The landmark gathering took place in the auditorium of the College of Physicians and Surgeons in Accra. The Economic Management Team is a body, set up by governments from the time of President Kufuor onwards to steer the affairs of the Ghanaian economy. It is usually chaired by the sitting Vice-President. With the takeover by the current government, President Akufo-Addo set up the current nine-member EMT in February 2017. Its chair is Vice-President Bawumia and Senior Minister Yaw Osafo-Maafo is vice-chair. Other members are Ken Ofori-Atta, Minister for Finance; Dr Owusu Afriyie Akoto, Minister of Food and Agriculture; John Peter Amewu, Minister of Energy; Professor George Gyan Baffour, Minister for Planning; Alan Kwadwo Kyerematen, Minister of Trade and Industry; and Dr Anthony Akoto Osei, Minister for Monitoring and Evaluation with Professor Joe Amoako-Tuffour as the team's secretary.